Blackberry Series: Playbook 7.0". Revolutionary 2-in-1 cable for charging power and transferring data simultaneously. SCREEN PROTECTOR. Fully compatible with your laptop and desktop. Screen Protector. This Coiled MicroUSB cable allows you to keep your 4G LTE BlackBerry PlayBook stay powered and quickly transfer essential data with your laptop. - Using a USB connection on your laptop and a microUSB connection on your 4G LTE BlackBerry PlayBook, this cable provides high speed USB 2.0data transfers. Sleek and compact design make it easy to take anywhere you need to connect your 4G LTE BlackBerry PlayBook to PC or Notebook. -Compatible with4G LTE BlacBerry Tablet 32GB (Cellular Wi-Fi) and BlackBerry PlayBook Tablets (WiFi) 16GB, 32GB & 64GB. Using a USB connection on your laptop and a microUSB connection on your BlackBerry PlayBook, this cable provides high speed USB 2.0data transfers, while simultaneously charging your PlayBook through your computer's USB port. Detachable 6ft (2M) Long USB cable can be used totransfer data between your BlackBerry PlayBook and your computer. -Compatible with4G LTE BlacBerry Tablet 32GB (Cellular Wi-Fi) and BlackBerry PlayBook Tablets (WiFi) 16GB, 32GB & 64GB only. Detachable 6ft Long USB cable can be used totransfer data between your BlackBerry PlayBook and your computer. -Works with both 4G LTE BlacBerry Tablet 32GB (Cellular Wi-Fi) and BlackBerry PlayBook Tablets (WiFi) 16GB, 32GB & 64GB only. Detachable Coiled USB cable can be used totransfer data between your BlackBerry PlayBook 4G LTE and your computer. - Advanced internal circuitry prevents your BlackBerry PlayBook 4G LTE from overcharging and short-circuiting. Advanced internal circuitry prevents your 4G LTE BlackBerry PlayBook from overcharging and short-circuiting. -Detachable Micro USB cable can be used totransfer data between your 4G LTE BlackBerry PlayBook and your computer. Detachable USB cable can be used totransfer data between your BlackBerry PlayBook and your computer, while simultaneously charging your PlayBook through your computer's USB port. -Works with 4G LTE BlacBerry Tablet 32GB (Cellular Wi-Fi) and BlackBerry PlayBook Tablets (WiFi) 16GB, 32GB & 64GB. The 1ft Short Right Angle USB cable is good for connecting your BlackBerry PlayBook to the front USB ports of your desktop computer in a tidy way. 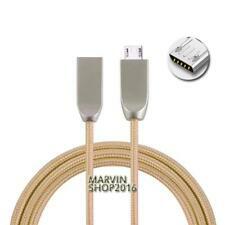 - 1ft USB cable (Right Angle Micro B plug to Type A plug) x 1. Blackberry Tablet Playbook series 16GB 32GB 64GB. This cable connects your tablet to USB-ready computer or USB hub for. Cable Length: 3 FEET, light and easy to carry around. data transferring and power charging. YBook (RDJ21WW). Charging from a lower powered socket will result in slower charging. Cable Length : 1.5 m.
• Sync Transfer Data from your Device to PC/Laptop. USB DATA SYNC/PHOTO TRANSFER USB CABLE LEAD. • Twisted-Pair construction to ensure high-speed, error-free data transfer. Using a USB connection on your laptop and a micro USB connection on your BlackBerry PlayBook, this cable provides high speed USB 2.0data transfers, while simultaneously charging your PlayBook through your computer's USB port.